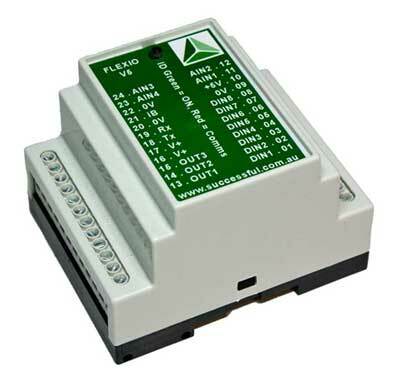 The FLEXIO system is intended as a customisable IO module for remote data acquisition, monitoring or control reach extension where conventional wiring is difficult or impractical. The system allows a remote IO unit to communicate back to a central host. This could be part of a larger SCADA system or a small stand-alone system. It can be hard-wired or connected via radio data modems. Input states can be read and output states set. This technology demonstrator has 8 inputs, 4 outputs, and iButton port and communicates via RS232 at 9600 BAUD.